SolidWorks estimates one million students use their software, from high schoolers to university students. This number may be based upon an approximately 3X factor applied to the 300,000 licenses sold or given away. Students may have bought the SolidWorks Education Edition (for as low as $99) or had it packaged with their design and drafting text books. 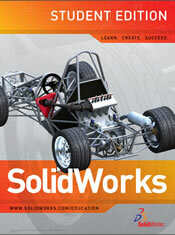 What's missing with the $99 SolidWorks Education Edition compared to the $4000 commercial version? Not a whole lot. It does everything the commercial version does but it only does it for 2 years. Also, output is watermarked "not to be used for commercial purposes." And, of course, you need to be a student to buy one. A number of design/drafting textbooks from publishers such as McGraw Hill and Prentice-Hall include a 150-day version SolidWorks, presumably giving enough time to complete a one semester course. Sowing seeds in schools is hardly a new concept. Apple computer has been doing it practically their whole existence. CAD companies are falling over themselves in a race to stuff their software into school labs, using rock-bottom pricing or even giving it away. All this is done in the hopes that when school's out, former students will buy --at full price--the tools they are familiar and comfortable with. Marie Planchard, director of education marketing at SolidWorks, thinks SolidWorks leads the race for young minds. Though other CAD products get hoisted on schools, they often just collect dust. "Other CAD products take too long to learn and students don't have that kind of time." She points to MIT students who had 11 weeks to design a solar-powered car. It is a widespread belief that SolidWorks is easy to use compared to Pro/ENGINEER or Unigraphics. But another reason SolidWorks will be successful in ingraining itself in schools is Planchard herself. Her engineering degrees and background as an educator and user advocate provide an ideal background for her present job. Did I say job? Listen to Planchard even briefly and you get the feeling this is no 9 to 5 job. Getting SolidWorks into the hands of students is more of a mission. And we are not just talking about SolidWorks for drafting, either. Why not have university students use SolidWorks and COSMOS for finite element analysis? Why should engineering students spend hours poring over the most complex equations for the simplest geometry, she asks, when software can solve real problems with complex geometry in minutes? Well, there is that academic inertia. Professors who have taught the same things the same way to generations of students are not likely to change quickly. Or maybe they just haven't listened to Marie Planchard.